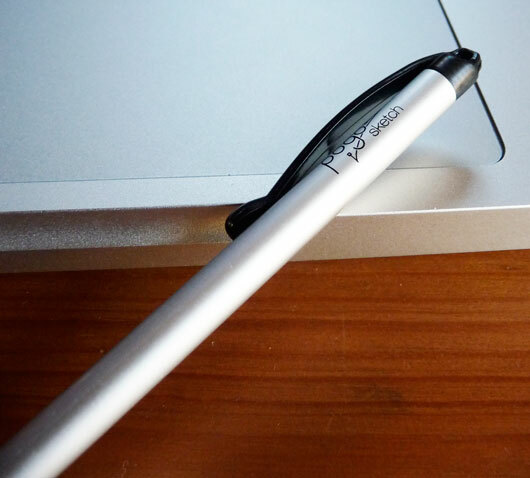 Pogo Sketch Stylus Turns Your Multi-Touch Trackpad Into A Drawing Tablet | OhGizmo! By Chris Scott Barr on 12/26/08 • Leave a comment! I spend a good bit of time doodling, enough that I picked up a Wacom tablet a couple of years ago. I admit that it’s helped me take my art in a new direction, and I rarely finish a project without using it. I don’t generally take it with me on trips, since it’s just one more thing to stuff in my laptop bag, plus I don’t usually do a lot of digital artwork on the road. Regardless, there are times where I wouldn’t mind doodling in Photoshop and find myself without any means. Well now I may just be able to use the trackpad on my MacBook Pro for minor drawing tasks. The recently-announced Pogo Sketch is a stylus which can transform a multi-touch MacBook or MacBook Pro trackpad into a tablet for drawing. It uses a special material on the tip which allows it to act as a bridge between your hand and the trackpad. This will allow you to have a precise drawing tool at your disposal anytime you’re near your laptop. You can also use it as a stylus for your iPhone or iPod Touch. The Pogo Sketch will go on sale at the beginning of January for just $15.